Leicester City Semantics: Upset? Champion? Leicester City winning the Premier League is very cool. I think it’s great for soccer/football. It’s great for the EPL. It weakens the claim that money = wins in sports. It is an inspiration to witness the achievement of a team that had to battle up from the lower divisions and then stare down regulation last season. And they were a fun team to watch. Jamie Vardy is a little crazy, but an exciting player to watch play. And as every commentator from here to Mars has pointed out, the Foxes were 5000 to 1 to win the league at the start of the EPL season. And their championship is being hailed in the media as the greatest upset in sports history. Upset?? Don’t make me go all Inigo Montoya on you all. It’s an amazing feat. It’s unheralded. It’s a “Cinderella” story even. But “upset”? No. Leicester were in first place for the last third of the season, and despite a few slips here or there, they’ve pretty much been top of the table since November. They were in the top 5 wire to wire. By January, the odds of the Foxes winning had come down from 5000 to 1 to 8 to 1 and by February they were one of the favorites, if not the favorite, to win the league. I am not sure how a team that is one of the favorites to win becomes the greatest upset of all times. As in so many things, this turns on what we mean by “upset”. I take an upset to refer to a situation when the unexpected team/player wins; when the team or player that is not supposed to win, that is not favored to win, wins. This doesn’t seem to apply to Leicester City after January. From that point to the end of the season, Leicester was top of the table and one of the favorites. So they were not unexpected, not the underdog. Sure, back in August Leicester was not expected to win, they were not supposed to win, they were certainly not favored for anything but regulation. That is part of what makes their championship so amazing and historic. But by January, we knew that Leicester was going to at least challenge for the championship. And by April it was nearly (unless you were a Spurs supporter) a foregone conclusion. So I ‘upset’ doesn’t apply. Speaking of Championships. I’ve also seen some criticisms of crowning Leicester City a champion without a championship match. Granted this usually comes from quarters less familiar with the structure of European soccer/football, but it is an interesting question. Does a champion need a championship match? I don’t think so. There is nothing incomplete about a league crowning the league winner as its champion. Playoff systems are exciting and thrilling, but they have their own concerns. (Podcast: The Value of Playoffs and Championships) One major one is that a weaker team can win if it gets lucky, gets hot at the right time, or because it gets an easier bracket. If a league doesn’t have a well-balanced schedule, then there is a good basis for needing a playoff system/championship game to determine the champion. If there is a team that the eventual champion didn’t play, that raises questions about the legitimacy of the champion. But in the Premier League every team plays every other team home and away. The EPL is a really long round robin tourney, so in many ways a championship match would be superfluous. And European soccer fans hungry for a playoff system get that in Champions league, the FA Cup, and other similar tourneys. Recap: Upset, no. Champions, yes. The 2012 Summer Olympics start July 27. Like most sports fans, I always get excited about the Olympics: the pageantry, the athleticism, and the glory of achievement. But this year, there is something else that will be amazing to see. The Fastest Man on No Legs will be racing in London. I am just fascinated by this story. It raises so many interesting issues! 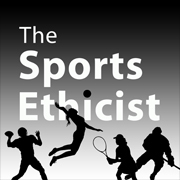 There is the obvious ethical and legal question: should an athlete that requires a technical device to compete be allowed to compete against athletes that do not? Is Pistorius actually running? That is, does the movement that he engages in count as a kind of running or is it something else? What is and ought to be our relationship to technology? Does it enhance our humanity or undermine it? Is Pistorius less human by needing technology to compete or is this a deeper expression of his humanity? What is the nature of an advantage and when is it to be counted as being an unfair advantage? These are not questions with easy or uncontroversial answers. They also bear on other ethical issues; for example, the issue of unfair advantage is relevant for the arguments regarding PEDs—and also for political and economic arguments more generally (how should we deal with unfair advantages in the market?). A quick search on Google or an academic database will turn up many articles tackling aspects of these issues. I am not going to get into them here in this post. I just want to highlight the issues raised by the Pistorius case. But more than that, I want to call attention to the fact that Pistorius will be in London for the Olympics. It is such a great story. Pistorius has overcome challenges and obstacles with which no other Olympiad as ever had to deal. 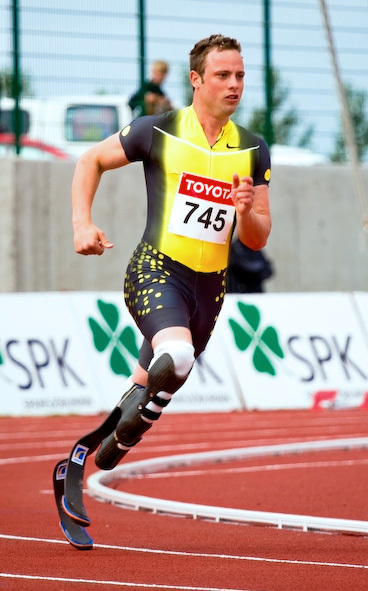 There is the obvious challenge of not having legs and running on prosthetics. The challenge of using prosthetics just to walk is probably hard enough for most people, let alone running, let alone running at times that qualify for the Olympics! But Oscar also had to fight a legal battle just to get the opportunity to compete in London. Initially banned from competing in the Beijing Olympics by the IAAF (International Association of Athletics Federations), Pistorius fought a legal battle to overturn the ruling. Oscar won the battle for Beijing, but was not able to qualify for the 2008 Olympics. On July 4, South African Sports Confederation and Olympic Committee (SASCOC) announced that Pistorius would be included in its Olympic squad. He will run in 4×400 meter relay and the Men’s 400-meter. Pistorius is to be admired and lauded for his ability and perseverance. He is a role model not just for disabled-athletes and individuals, but everyone. Through hard work, discipline, and training, he has made his dream come true. He has not let ignorance or prejudice stand in his way. He has not let his lack of legs keep him from pursuing his dreams or living the life he chooses. For these reasons alone, I will be rooting hard to see Pistorius upon his blades standing proud on the medal podium.